Here is my latest cover article for Pulse Magazine. I write for a lot of magazines, so why am I posting this one on my blog? Because it is for a traditional hospital publication. It reiterates what I’ve known for a long time. There is now NO doubt that yoga, meditation and a gratitude practice lengthens life, improves health, boosts mental outlook, and reduces pain and the intensity of disease. I love when I get the chance to write, research, and interview experts on topics I’m passionate about. I began doing yoga and meditating more than 10 years ago due to a bad back, a nasty divorce, and the stress of rearing a baby and a young son solo. The journey has helped me battle auto-immune disease and dark moments. I have taken multiple yoga trainings and now teach, while also free-lance writing. My life is more positive. I feel joy on the daily. I am more patient and more present with my boys. And I see how much yoga has helped my yoga students who are in pain from cancer or arthritis or injuries. Now physicians and scientists in the West confirm what I have felt and seen through many studies conducted at Harvard, the Centers for Disease Control, UCLA and elsewhere. Some studies showed how meditation and a gratitude practice helped to reduce cancer tumors and/ or the intensity of pain and side-effects from cancer treatments such as chemo or radiation. Other studies showed an increase in memory from meditation. Others showed how meditation, especially, increased the capacity for joy and reduced depression. One day I envision an America where therapeutic yoga and meditation classes will be a standard benefit offered within corporations and covered by medical insurance policies. Lowering stress means reducing toxic cortisol and glucagon hormones within the body. It is widely accepted within western medicine that cancer grows within acidic environments. It is also known that a flush in cortisol, (that happens when individuals are stressed or anxious or angry) causes the gut to not thoroughly digest vitamins and nutrients correctly. This flush of cortisol also tightens connective tissue which reduces the flow of our lymph system and makes us more vulnerable to the flu. Stress also increases inflammation, ramps up blood pressure, creates tension headaches, muscle spasms and even increases the chance of stroke and heart beat irregularity. Taking preventative care of ourselves ought to be a primary concern—and not just for the privileged and wealthy in this country. I’m glad to know that yoga and meditation is now taught at reduced rates in hospitals (where I also teach) and community centers, as yoga studios can charge high rates. Most yoga studios, however, will also offer low-fee community classes once a week, which I highly encourage people to try. Here’s to a low stress and blessed week. 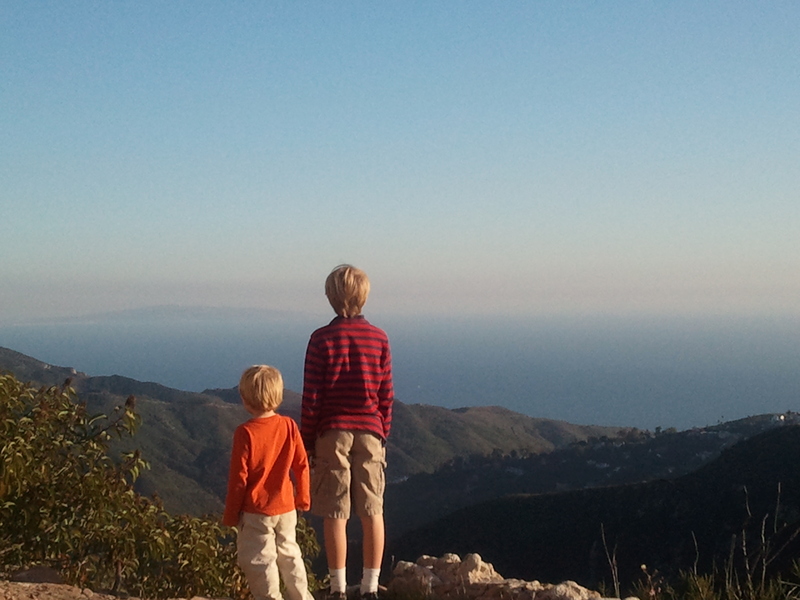 The boys and I hiked up to the top of one of the highest canyons in Malibu to get this vista of Catalina Island and the vast Pacific Ocean. Taking a moment to pause, especially when at a distance, can truly give you a better vantage point. It’s easier to put things into perspective when you give yourself that distance and that moment to take it all in. Lately I’ve been thinking that this is applicable to everyday life—although it takes much more effort. Trying not to react instantly, or to flare with anger, or to over-react—takes more than just patience. I think it takes practice. Ironically, in order to have a better relationship with those I care the most about—I’ve come to realize that I need to find a little bit of distance, or detachment, to create a mental vista for clarity and calm. Maybe this sounds a bit nutty for some of you? But have any of you suddenly become irritated with your child who is not listening to you and who continues to do something that you’ve asked him or her not to do? Do you find that, without thinking, you snap, yell, grab an arm or say something that you wish you hadn’t? It’s easy to do isn’t it? When I react instinctively, I can literally feel my heart beat faster, my breath get fast and shallow and all clear thought escape the building. As my yoga teachers and Deepak Chopra have all shown me—it’s almost impossible to overreact while breathing deeply. Try it with me. Take a deep breath and fill up your lungs completely. Hold it at the top and count to five slowly. Now, breathe it out, slowly and deeply. 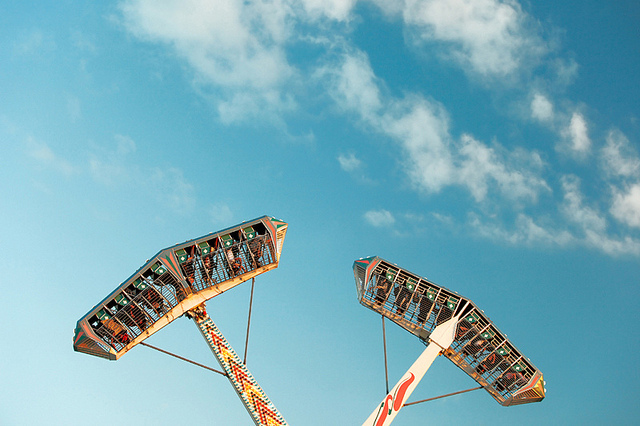 Can you imagine your heart or mind racing while you’re doing this? It’s virtually impossible. I was reminded twice this week of how important this breath break is. The first was a yoga teacher who said she wanted to focus on finding a pause before reacting. Her goal for the week was to pause during stressful events in order to choose the right reaction, instead of reacting. Then two days later, I snapped at my boys. After trying to get James to sleep for two hours unsuccessfully, his big brother comes into the room, making too much noise and knocking over and spilling the humidifier. Was it the end of the world? No. What did I do? Overreact and chastise him. Of course, I immediately apologized, and realized how I should have reacted. Hopefully, taking a deep breath, holding it for the count of five and slowly letting it go, will give me the vantage point I need to then deal calmly with any stressful moments with the kids—or in life in general. I’ll let you know how it goes! 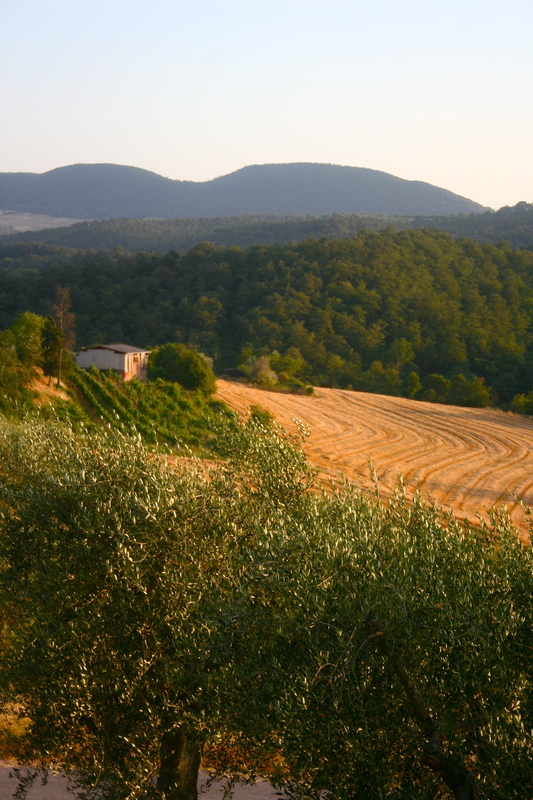 I can’t seem to tire of the Tuscan landscape. I have been here for two and a half weeks now and am still in love with the rolling hills, the textures and the vibrant colors of this region of Italy. Deep greens, golden fields and silver wisps of leaves surround me. 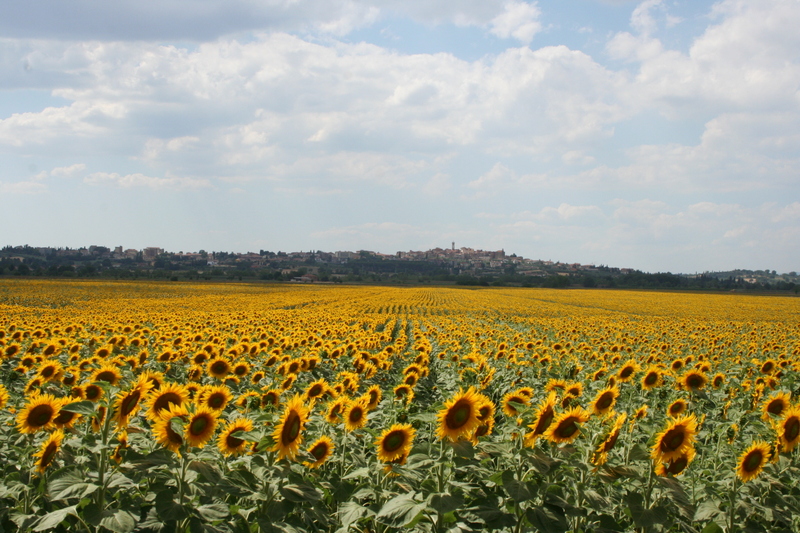 As you drive, or walk, throughout Tuscany you see amazing landscapes such as this, that have been manipulated by man for centuries. 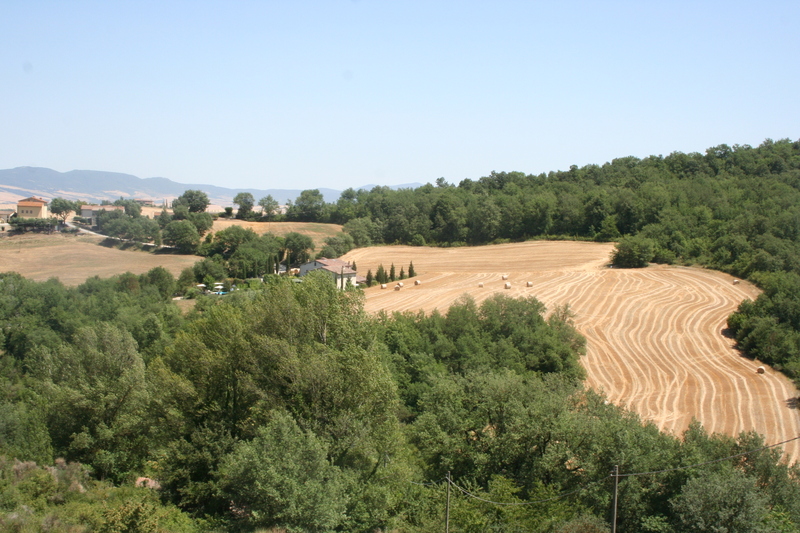 The curved rows of plowed, mustard-yellow fields are of the semolina wheat used to make pasta (that I am eating too much of!). By the end of June, most fields are plowed with bales of wheat rolled and waiting. 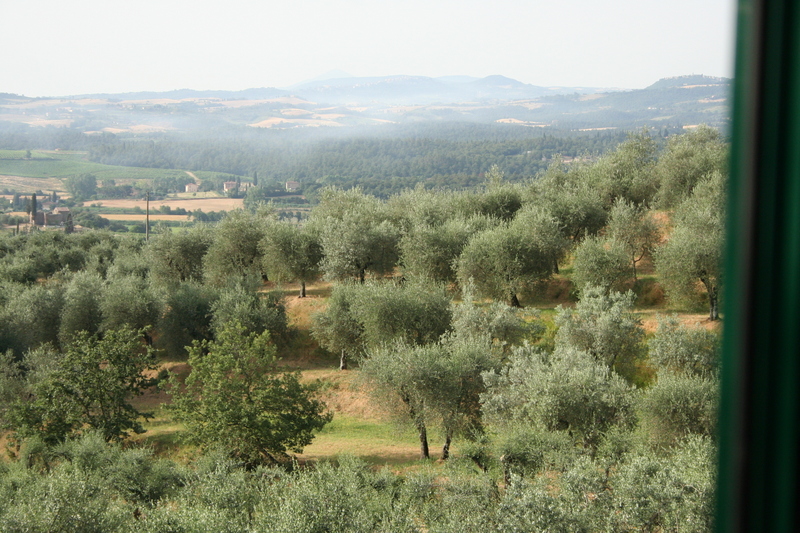 I adore the ever-present groves of olive trees, like these just outside our window. 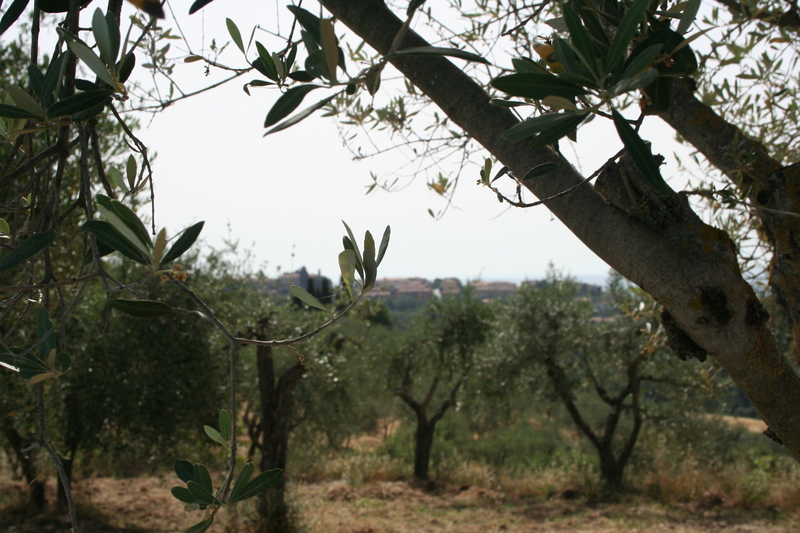 The Frantoio Franci olive oil company is in walking distance to our vila. These are younger trees that are not producing usable olives just yet. Off in the distance, are older, more rugged trees with darker leaves, that are being harvested. 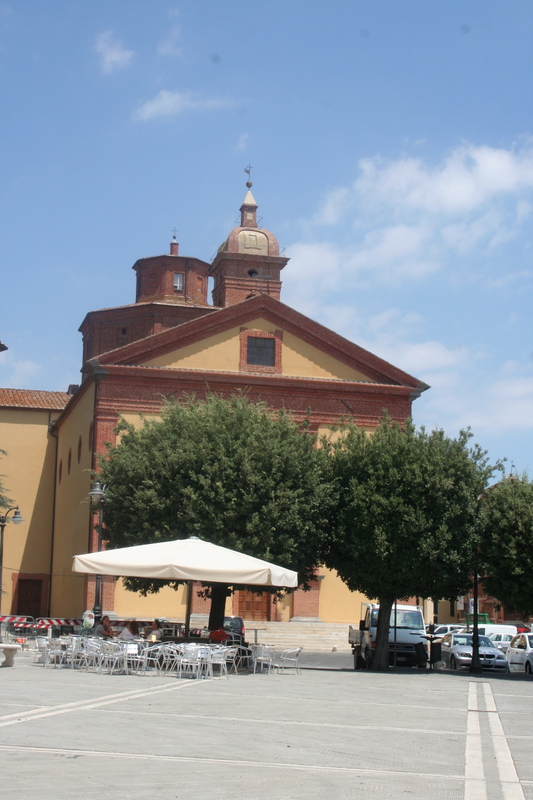 I sit in the local piazza. I notice a grandfather making amusing faces at his grandson as he buys him a gelato before heading home. I hear the adorable singsong voices of children who say papa! as they run home. A woman smiles and makes fun of me, calling me an “Alaskan” since I prefer ice cubes in my drink. I notice a momma bird feed her baby bird bread crumbs on the piazza floor. 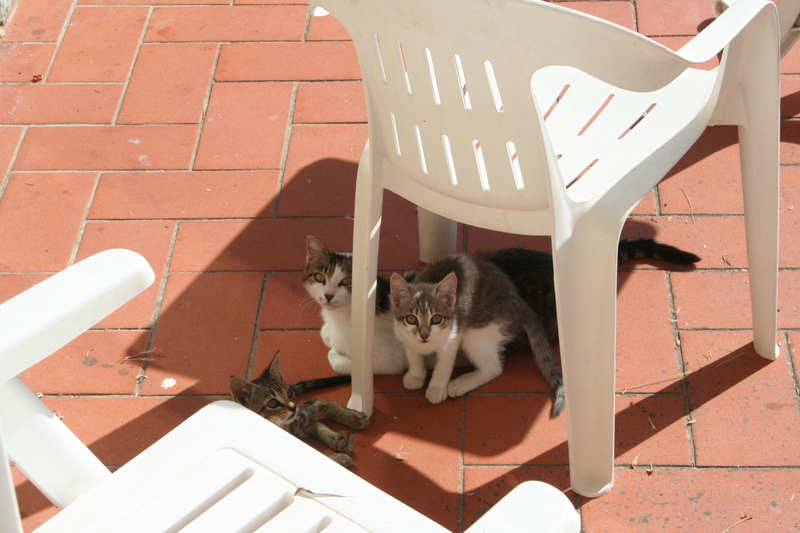 I see a momma cat and her kittens hide in the shade of chairs. 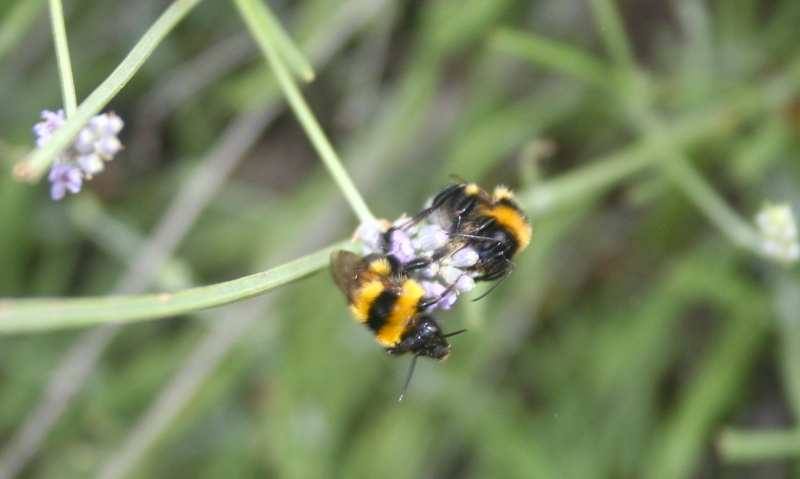 I watch bees harvesting nectar from the potted lavender bushes and hear the bells chime from the convent on the hill above the village. A Vespa whines in the distance. I take a bite from my panini of prosciutto di Parma and Fontina cheese and think how marvelous it is that I haven’t once looked at a cell phone text or read an email. This won’t last, of course. But I am so thankful to have been given this temporary taste of freedom from my addiction to the Internet and with the need to keep up with all things and all people all the time. I give in and tell myself that my boys are just fine without me for a brief time. I pull out a map and start to plan a day excursion to another village. I begin to think about dinner—the obsession with food is quite contagious in Italy. And by the end of an hour, I head back home. Perhaps boring for some, but for me, being in the moment and present in my surroundings is a gift. I want to bottle it up and take it home. It’s a delicate balancing act, especially as a single mom, to simultaneously take care of yourself and also be present and focused on your children. The two goals constantly come in conflict with one another—and yet experts often advise us to do one, or the other, or both, with little instructions on how to do so. For instance, earlier in the week, when working on a Lifechangers article for Dr. Drew’s Lifechangers show, I interviewed Rebecca E. Eberlin, Ph.D., a family psychologist who runs “Navigating Divorce For Your Children” workshops at the UCLA Commons in Santa Monica, Calif. She insisted, and I tend to agree, that when parents are in the process of getting a divorce, they need to focus 100% of their choices on how they will affect their kids. In fact, she listed focusing on yourself and not on your children as one of the top 5 mistakes that most divorcing parents make. After speaking with her for an hour, I could see her point completely. On the flip side, are you (like me) sometimes frustrated when someone says: “you need to take care of yourself”? If you’re a single mom—especially those of us with small children, full-time care of those children, and little family support—the idea of taking a spa day seems nearly impossible. But taking care of yourself means very different things to different people. One of my favorite bloggers, Tracie Louise, eloquently explained some of the ways she takes care of herself in her latest post “Being Selfish”. I know that I can’t always afford to get manicures, facials, massages, or go on shopping sprees, for instance. I do know, however, that it’s possible to squeeze in time during the week to go on a run (even if it requires a three-year-old in the stroller); take a bath (hopefully without a baby, but trust me, he’s snuck in before! ); meditate; write; or take a community yoga class. Another selfish thing for me is to ignore the dinner mess and mounds of laundry and snuggle with my boys while watching a favorite show. I think the biggest goal for me, and perhaps for some of you too, is to strike that delicate balance—when the pendulum finally rests at the center—between focussing on my children and their needs and exploring my own and having a bit of fun. During the first year of my separation I may have used the excuse of focussing on my kids to hibernate. Granted, my youngest was still a baby, but the only time I spent out was either pushing the stroller while he slept; cheering on the oldest on the soccer field; volunteering in the classroom; or writing an article at a coffee shop. It was quite hard for me to reach out to others, take exercise classes, or even sleep well—as I slept with the baby each night. I put on a good face, but I was literally getting by, moment by moment. Almost two years later, I try to ensure that I continue to cheer my oldest on at concerts or at soccer games; volunteer once a week at school; work; exercise; meditate; and find time for fun with the special person in my life. The effort is well worth it. If you are where I was in my first year of separation—where you can barely muster up energy to do anything for yourself—I dare you to write down five things you’d like to incorporate into your life with a roadmap to make them happen. Even if it’s just sleeping in once a month. If this is too easy, I dare you to go even further: write down one thing you can do every day just for you. You’d be surprised how you can sneak some “me-time” in—even when you don’t have sitters or you have too much work piling on. Yesterday, with the baby sick at home, I thought it would be impossible to exercise or meditate. Well, a snuffly nose makes sleeping sitting up easier, so I put the little guy in the stroller and took off for an hour run while he slept soundly. In the evening, as the boys were watching a show after dinner, I snuck to my room and meditated for five minutes. I let myself focus on gratitude and putting a negative person’s actions and judgmental words out of my life. When the boys came down to find me, I was able to be present with them and even laughed when the youngest spilled juice on the floor. So, what I’m trying to say—in my characteristically verbose way—taking time out for yourself helps you spend more quality time with your kiddos. It’s hard to snap at the little ones after you mediate isn’t it? For the rest of us…there are no more excuses. I’m adding one more item to my weekly for-me wish list. How about you?